By the time your child turns five, he can really do chores that are helpful in the home. this is such a blessing and benefit in the home! It is so nice to have your little people start to help contribute to cleaning up after themselves and not just making messes. Here is a list of chores you can expect a five year old to do. 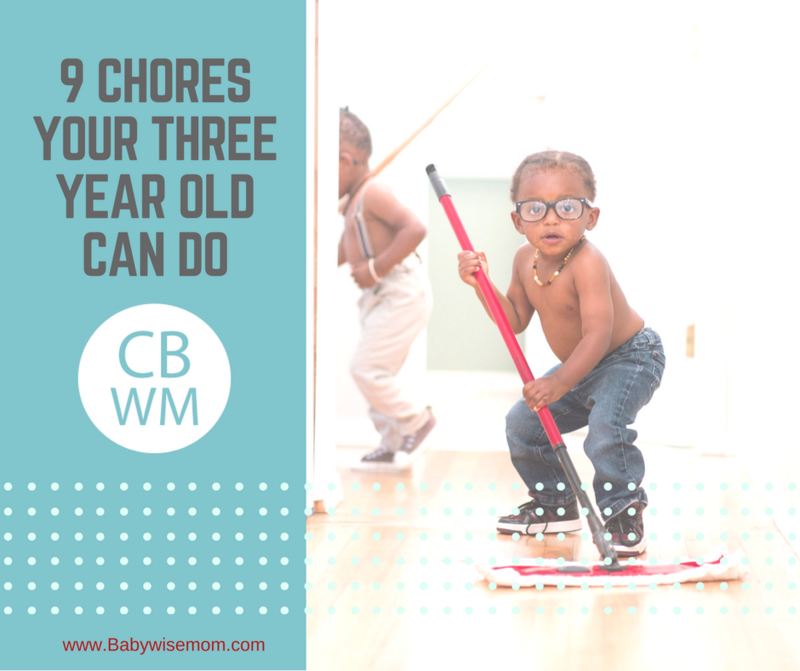 Now, with these chores, always keep in mind that you need to teach the child how to do the chore and give time for the child to work at it, practice, and get better over time. Just because “help clear the table” is on the list won’t mean your five year old will know exactly what that looks like and be a pro the first time you have him help. So look at these as skills to work on over the entire year five. Also, be sure your child is doing the chores from the previous lists I have shared before adding on these chores. I have linked those at the end of this post. Clear the Table: Have your five year old help clear the table. Decide on things your child can put away that you are okay with. You need to expect some spills; food might fall from a plate. A dirty spoon might fall on the floor. Remember the child is learning. You can have your child move things from the table into the kitchen or go as far as having the child literally put stuff away where it goes. Straighten A Room: A five year old can straighten up a room. A five year old can even reasonably be expected to clean her own room. It might not be as organized as you would clean it–that is highly dependent on the child’s personality. But it can still be done. times (at least) before leaving your child to it. Prep Own Lunch: Your five year old can prep most if not all of her own lunch if lunch is simple enough. Clean Base Moldings: I have a hard time getting base moldings cleaned as often as I like, so I love having a child do base moldings from time to time. This is a great task for a five year old. Fold Laundry: I have my children help fold laundry starting at four or five. This is a task that requires your patience for sure. The children quickly improve at this skill. Fold Socks: A five year old can fold socks and sort them to piles of who the socks belong to. If you fold the way where one sock goes into the other, this is a skill that may take several months to develop–it is a motor skill. Put Laundry Away: A five year old can learn to put clothes on the hanger. If the bar is low enough in the closet or a step stool is availale, the child can even hang those clothes back up in the closet. The child can also put clothes away neatly that are folded. I HIGHLY recommend teaching children these laundry skills at five. 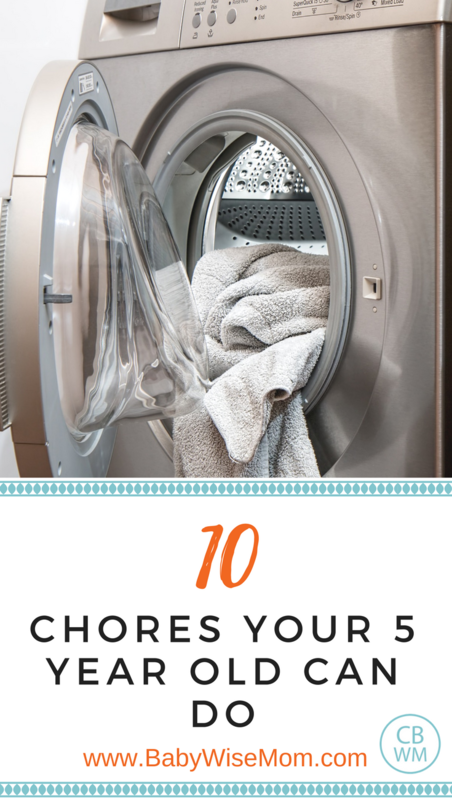 You have no idea how much time and mental load will be lifted off your plate when you can hand your child her basket of laundry and say, “Put your laundry away!” and you walk away. So amazing. 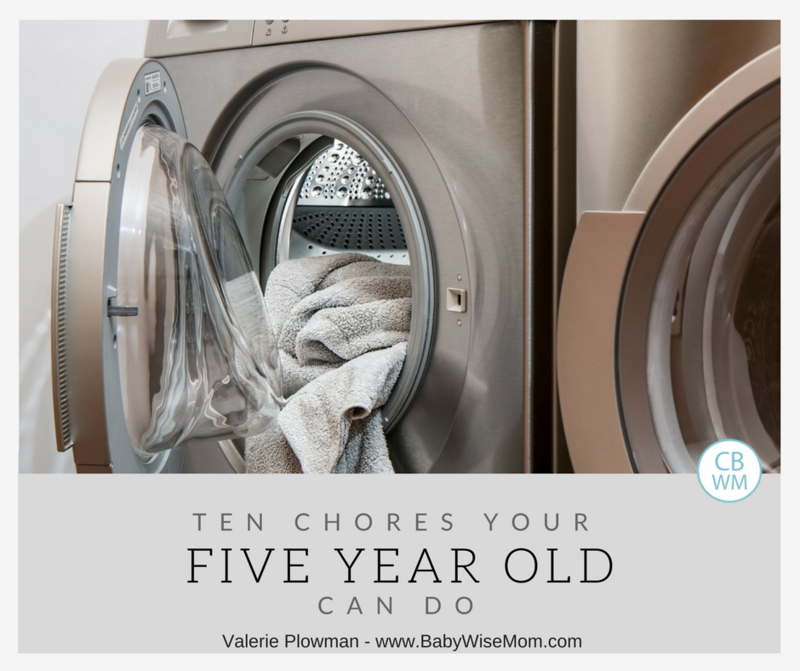 You probably won’t get to that point with a five year old, unless the five year old is very much detail oriented and takes care to be neat, but it will happen by six or seven. It is a goal worth working toward, from one mom to another. Be a Runner: When I am organizing and decluttering, I LOVE having a child with me. I will hand an item to the child and have her run it where I need it to go. It saves me so much time. 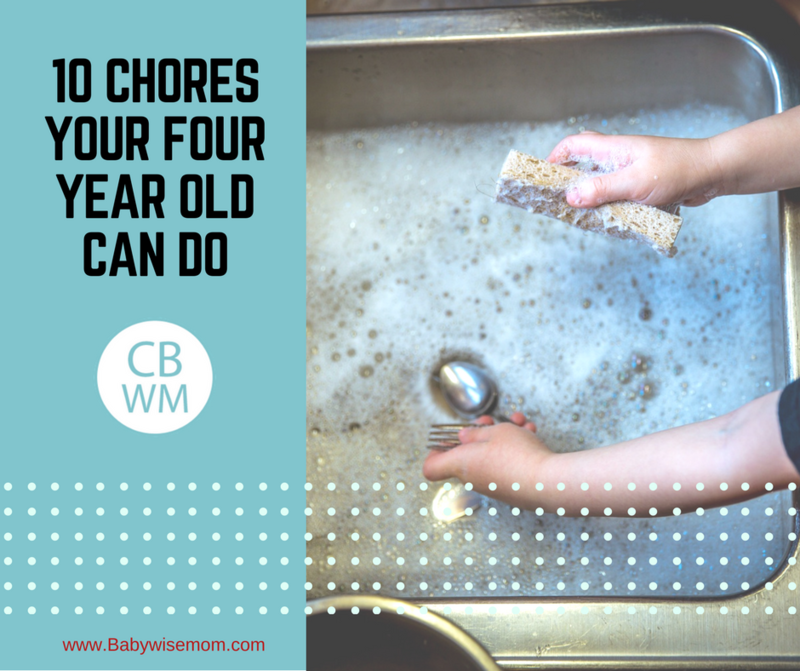 Build on Previous Chores: Your child has some chores already on her resume. You can build on those. As a four year old, you introduced unloading the dishwasher. You may have started with the silverware. This year, add something else she can reach and have that be her job, also. Do not look at this list and decide your child needs to do all of them tomorrow. You can add one skill a month over the course of being five. I have ten items here for you. Pick the ten best months for you to work on a skill and focus on one a month. If your child catches on faster, you can add more quickly. I like to have the child observe a chore for a while. 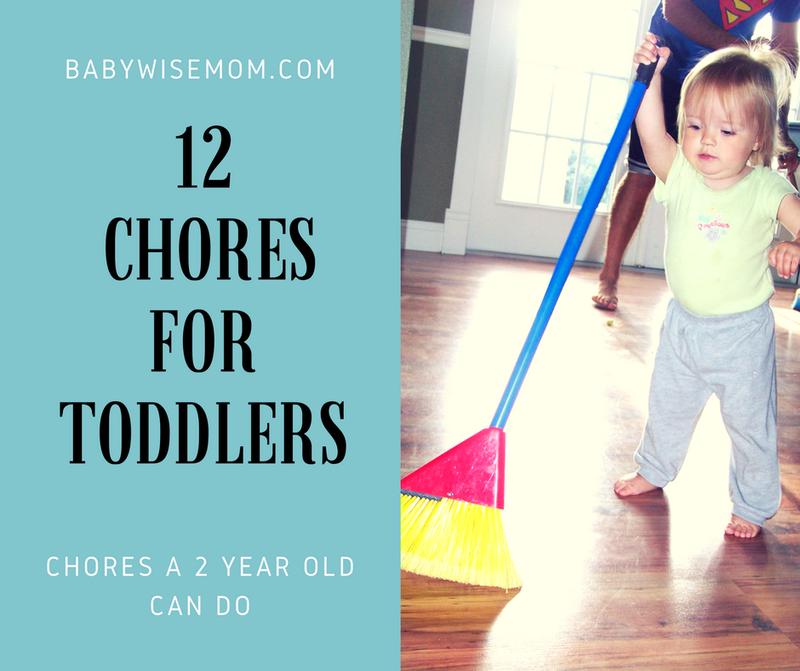 Then I help the child with the chore for a while, then I observe the child doing the chore and correct if needed. I finish up by giving instructions and then walking away so the child can work freely without me helicoptering around.